How does mileME help me be more productive? 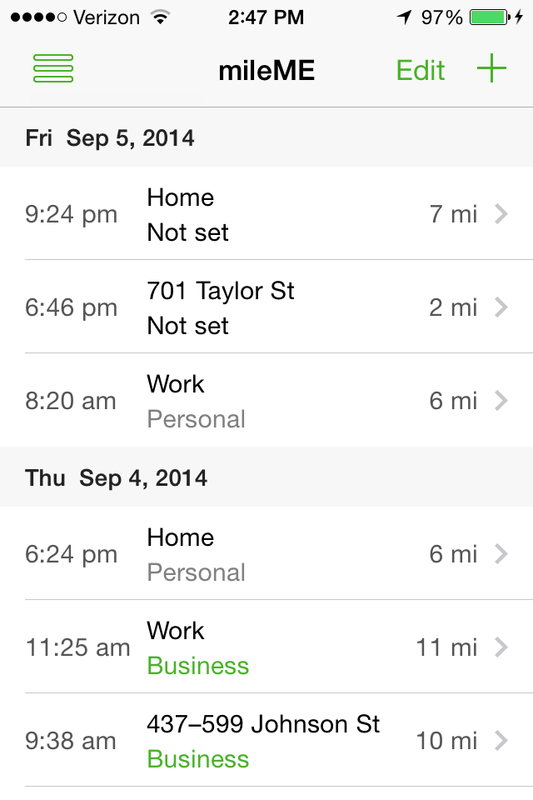 mileME is a productivity app that enables automatic mileage logging for expense reporting and tax deductions. mileME takes care of logging your trips for you. Once you install and launch mileME you can literally focus on your most productive tasks and ignore mileME while it logs your miles. Your miles will be automatically logged. Trips are automatically categorized per your calendar. You can set up automatic exports of your mileage log for expense reports or tax filing. This is completely automatic mileage logging. mileME is not logging my trips. What can I do? Check that tracking is turned on in the mileME settings. Please turn Wi-Fi on and leave it on. How can I extend my iPhone's battery life? Enable Wi-Fi. It's also a good idea to log in to the Wi-Fi hotspots where you spend a lot of time, especially home and work. When accessing data this uses less battery than 3G/4G and the battery drain from keeping Wi-Fi running is minimal. If you don't like to be notified whenever an open Wi-Fi network is available, turn off Settings > Wi-Fi > Ask to Join Networks. Reduce the frequency of checking for emails. Go to Settings > Mail, Contacts, Calendars > Fetch New Data. You can turn off Push and/or reduce the Fetch interval. Activate Airplane Mode when you have few or no signal strength bars. Don't kill apps by removing them from the list of running apps. This actually uses additional battery power when you restart the apps again that you use anyways. If you want to control which apps may run in the background, check the next tip. Control which apps can run in the background. Go to Settings > General > Background App Refresh and turn off the apps you don't want running in the backgrund. Please remember that mileME needs to run in the background to log your trips. Go through a full charge cycle once a month. This means letting your battery die and then fully charging the phone again. Ideally wait a couple of hours after the Battery Indicator displays 100%. Do I have to turn mileME on and off for each trip? No. At the start of a trip in your car you literally do nothing with mileME. mileME is quietly checking your motion and then noting the start location. When you end your trip, you again do nothing. mileME will automatically update your log in about 5 minutes. Does mileME use GPS to create a log? mileME utilizes a wide range of location sensing features in your iPhone to determine when you are in motion, your point of origination, your ending destination, approximate time of travel, distance traveled, and correlation to appointments in your calendar. GPS consumes a lot of battery power so mileME rarely turns it on. Does mileME require me to turn on WiFi? Yes, but it's not necessary for you to log into a WiFi hotspot. 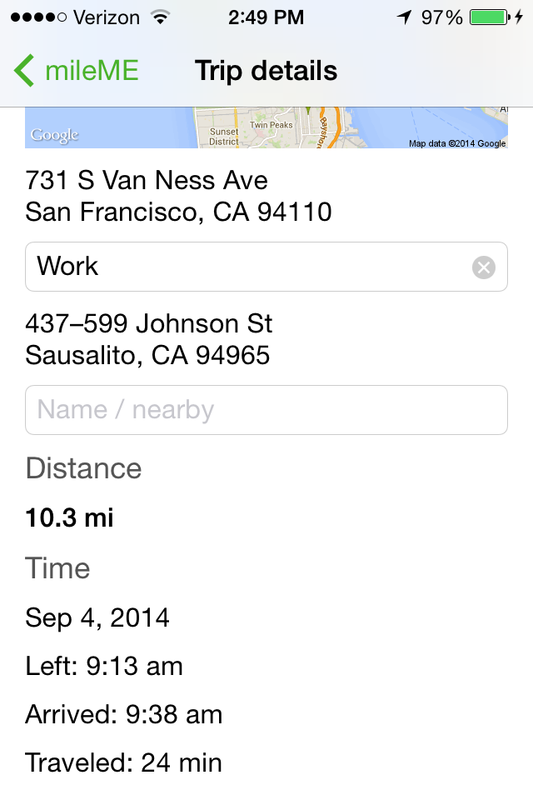 mileME utilizes a wide range of location sensing features in your iPhone including WiFi. Like all mileME functions, turn it on once and ignore it from then on. mileME will determine when you are in motion, your point of origination, your ending destination, approximate time of travel, distance traveled, and correlation to appointments in your calendar. Will mileME run down my battery? The novel mileME technology sips battery power barely above normal iPhone resting status. You won’t need to plug your iPhone into a car charger to log trips. The miles you log are your private information. You can delete or modify the trips in your log. Neither your miles nor your locations are reported to third parties. Your log is automatically and securely backed up to the cloud so you can edit or export a log for your expense report or tax records. Yes. Our website has an option in Settings to remove your account. You may be asked to sign in first with your email and password created in the app. All data associated with your account will be deleted. After you download the app from the App Store, please launch mileMe on your iPhone by clicking the mileME icon. Your email and a password to create your mileME account. Permission to access your calendar. 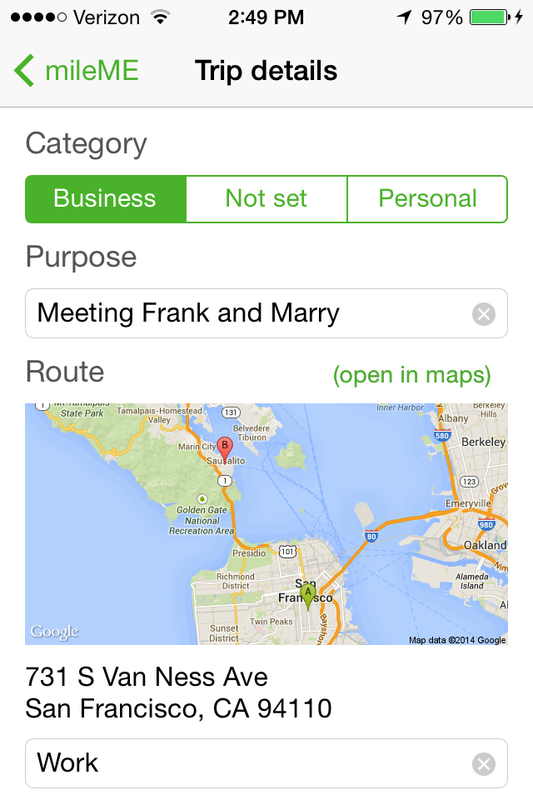 This is optional and allows mileME to automatically match your trips to events in your calendar. Permission to turn on location sensing. This is needed to log your trips. We would welcome your kind suggestions to improve mileME, fix bugs, add features, and make mileME assist you to be more productive.